For other people named John Byng, see John Byng (disambiguation). Admiral John Byng (baptised 29 October 1704 – 14 March 1757) was a Royal Navy officer. After joining the navy at the age of thirteen, he participated at the Battle of Cape Passaro in 1718. Over the next thirty years he built up a reputation as a solid naval officer and received promotion to vice-admiral in 1747. He also served as Commodore-Governor of Newfoundland Colony in the 1740s, and was a Member of Parliament from 1751 until his death. Byng is best known for failing to relieve a besieged British garrison during the Battle of Minorca at the beginning of the Seven Years' War. Byng had sailed for Minorca at the head of a hastily assembled fleet of vessels, some of which were in poor condition. He fought an inconclusive engagement with a French fleet off the Minorca coast, and then elected to return to Gibraltar to repair his ships. Upon return to Britain, Byng was court-martialled and found guilty of failing to "do his utmost" to prevent Minorca falling to the French. He was sentenced to death and shot by firing squad on 14 March 1757. John Byng was born in the village of Southhill, Bedfordshire in England, the fifth son of Rear-Admiral Sir George Byng (later Admiral the 1st Viscount Torrington). He entered the Royal Navy in March 1718, aged 13, when his father was a well-established admiral at the peak of a uniformly successful career. George Byng had supported King William III in his successful bid to be crowned King of England in 1689 and had seen his own stature and fortune grow. He was a highly skilled naval commander, had won distinction in a series of battles, and was held in esteem by the monarchs whom he served. In 1721, he was rewarded by King George I with a viscountcy, being created Viscount Torrington. Early in his career, John Byng was assigned to a series of Mediterranean postings. In 1723, at age 19, he was made a Lieutenant, and at 23, rose to become Captain of HMS Gibraltar. His Mediterranean service continued until 1739 and was without much action. In 1742, he was appointed Commodore-Governor of the British colony of Newfoundland. He was promoted to Rear-Admiral in 1745, and to Vice-Admiral in 1747. He was Member of Parliament for Rochester from 1751 until his death. In 1754, Byng commissioned the building of the Palladian mansion Wrotham Park in Hertfordshire, which remains in the family to this day. It is doubtful whether he ever lived there. He is buried in All Saints Church in Southill, Bedfordshire, an estate of the Torrington family. The island of Minorca had been a British possession since 1708, when it was captured during the War of the Spanish Succession. On the approach of the Seven Years' War, it was threatened by a French naval attack from Toulon, and was invaded in 1756. Byng was serving in the Channel at the time and was ordered to the Mediterranean to relieve the British garrison of Fort St Philip, at Port Mahon. Despite his protests, he was not given enough money or time to prepare the expedition properly. His fleet was delayed in Portsmouth for five days while additional crew were found. By 6 April, the ships were sufficiently manned and put to sea, arriving at Gibraltar on 2 May. Byng's marines were landed to make room for the soldiers who were to reinforce the garrison, and he feared that, if he met a French squadron, he would be dangerously undermanned. His correspondence shows that he left prepared for failure, that he did not believe that the garrison could hold out against the French force, and that he was already resolved to come back from Minorca if he found that the task presented any great difficulty. He wrote home to that effect to the Admiralty from Gibraltar, whose governor refused to provide soldiers to increase the relief force. Byng sailed on 8 May 1756. Before he arrived, the French landed 15,000 troops on the western shore of Minorca, spreading out to occupy the island. On 19 May, Byng was off the east coast of Minorca and endeavoured to open communications with the fort. The French squadron appeared before he could land any soldiers. The Battle of Minorca was fought on the following day. Byng had gained the weather gage and bore down on the French fleet at an angle, so that his leading ships went into action while the rest were still out of effective firing range, including Byng's flagship. The French badly damaged the leading ships and slipped away. Byng's flag captain pointed out to him that, by standing out of his line, he could bring the centre of the enemy to closer action, but he declined because Thomas Mathews had been dismissed for so doing. Neither side lost a ship in the engagement, and casualties were roughly even, with 43 British sailors killed and 168 wounded, against French losses of 38 killed and 175 wounded. Byng remained near Minorca for four days without establishing communication with the fort or sighting the French. On 24 May, he called a council of his captains at which he suggested that Minorca was effectively lost and that the best course would be to return to Gibraltar to repair the fleet. The council concurred, and the fleet set sail for Gibraltar, arriving on 19 June, where they were reinforced with four more ships of the line and a 50-gun frigate. Repairs were effected to the damaged vessels and additional water and provisions were loaded aboard. However, before his fleet could return to sea, another ship arrived from England with further instructions, relieving Byng of his command and ordering him to return home. On arrival in England he was placed in custody. Byng had been promoted to full admiral on 1 June, following the action off Minorca but before the Admiralty received Byng's dispatch giving news of the battle. The garrison resisted the Siege of Fort St Phillip until 29 June, when it was forced to capitulate. Under negotiated terms, the garrison was allowed passage back to England, and the fort and island came under French control. Byng's failure to relieve the garrison at Minorca caused public outrage among fellow officers and the country at large. Byng was brought home to be tried by court-martial for breach of the Articles of War, which had recently been revised to mandate capital punishment for officers who did not do their utmost against the enemy, either in battle or pursuit. The revision to the Articles followed an event in 1745 during the War of the Austrian Succession, when a young lieutenant named Baker Phillips was court-martialed and shot after his ship was captured by the French. His captain had done nothing to prepare the vessel for action and was killed almost immediately by a broadside. Taking command, the inexperienced junior officer was forced to surrender the ship when she could no longer be defended. The negligent behaviour of Phillips's captain was noted by the subsequent court martial and a recommendation for mercy was entered, but Phillips' sentence was approved by the Lords Justices of Appeal. This sentence angered some of parliament, who felt that an officer of higher rank would likely have been spared or else given a light punishment, and that Phillips had been executed because he was a powerless junior officer and thus a useful scapegoat. The Articles of War were amended to become one law for all: the death penalty for any officer of any rank who did not do his utmost against the enemy in battle or pursuit. The court martial sitting in judgement on Byng acquitted him of personal cowardice and disaffection, and convicted him only for not having done his utmost, since he chose not to pursue the superior French fleet, deciding instead to protect his own. Once the court determined that Byng had "failed to do his utmost", it had no discretion over punishment under the Articles of War. In accordance with those Articles the court condemned Byng to death, but recommended that the Lords of the Admiralty ask King George II to exercise his royal prerogative of mercy. First Lord of the Admiralty Richard Grenville-Temple was granted an audience with the King to request clemency, but this was refused in an angry exchange. Four members of the board of the court martial petitioned Parliament, seeking to be relieved from their oath of secrecy to speak on Byng's behalf. The Commons passed a measure allowing this, but the Lords rejected the proposal. 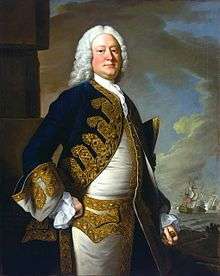 Prime Minister William Pitt the Elder was aware that the Admiralty was at least partly to blame for the loss at Minorca due to the poor manning and repair of the fleet. Lord Newcastle, the politician responsible, had by now joined the Prime Minister in an uneasy political coalition and this made it difficult for Pitt to contest the court martial verdict as strongly as he would have liked. He did, however, petition the King to commute the death sentence. The appeal was refused; Pitt and King George II were political opponents, with Pitt having pressed for George to relinquish his hereditary position of Elector of Hanover as being a conflict of interest with the government's policies in Europe. The severity of the penalty, combined with suspicion that the Admiralty sought to protect themselves from public anger over the defeat by throwing all the blame on the admiral, led to a reaction in favour of Byng in both the Navy and the country, which had previously demanded retribution. Pitt, then Leader of the House of Commons, told the King: "the House of Commons, Sir, is inclined to mercy", to which George responded: "You have taught me to look for the sense of my people elsewhere than in the House of Commons." The King did not exercise his prerogative to grant clemency. Following the court martial and pronouncement of sentence, Admiral Byng had been detained aboard HMS Monarch in the Solent and, on 14 March 1757, he was taken to the quarterdeck for execution in the presence of all hands and men from other ships of the fleet in boats surrounding Monarch. The admiral knelt on a cushion and signified his readiness by dropping his handkerchief, whereupon a squad of marines shot John Byng dead. Byng's execution was satirized by Voltaire in his novel Candide. In Portsmouth, Candide witnesses the execution of an officer by firing squad and is told that "in this country, it is good to kill an admiral from time to time, in order to encourage the others" (Dans ce pays-ci, il est bon de tuer de temps en temps un amiral pour encourager les autres). Byng was the last of his rank to be executed in this fashion and, 22 years after the event, the Articles of War were amended to allow "such other punishment as the nature and degree of the offence shall be found to deserve" as an alternative to capital punishment. In 2007, some of Byng's descendants petitioned the government for a posthumous pardon. The Ministry of Defence refused. Members of his family continue to seek a pardon, along with a group at Southill in Bedfordshire where the Byng family lived. "a culture of aggressive determination which set British officers apart from their foreign contemporaries, and which in time gave them a steadily mounting psychological ascendancy. More and more in the course of the century, and for long afterwards, British officers encountered opponents who expected to be attacked, and more than half expected to be beaten, so that [the latter] went into action with an invisible disadvantage which no amount of personal courage or numerical strength could entirely make up for." ↑ "Biography: John Byng". National Museum of the Royal Navy. Retrieved 27 August 2014. 1 2 3 Godfrey, Michael (1974). "Byng, John". In Halpenny, Francess G. Dictionary of Canadian Biography. III (1741–1770) (online ed.). University of Toronto Press. ↑ Rayment, Leigh. "Rochester (Kent)". House of Commons. Retrieved 11 November 2010. 1 2 3 4 5 6 7 8 9 10 Hannay, David (1911). "Byng, John". In Chisholm, Hugh. Encyclopædia Britannica. 4 (11th ed.). Cambridge University Press. ↑ Rodger, N. A. M. (1986). "Discipline". The wooden world: an anatomy of the Georgian navy. London: Collins. pp. 247–48. ISBN 0-00-216548-1. 1 2 3 4 5 6 7 Tute, Warren (1983). The True Glory, The Story of the Royal Navy over a thousand years. London: Macdonald & Co. pp. 81–83. ISBN 0-356-10403-6. ↑ Laughton, John Knox (1887). Studies in Naval History. London: Longman Green. p. 262. OCLC 669137632. 1 2 Ware, Chris (2009). Admiral Byng: His Rise and Execution. Barnsley, England: Pen and Sword Maritime. pp. 151–153. ISBN 1-84415-781-4. ↑ Macaulay, Thomas Bablington (1861). "William Pitt, Earl of Chatham", Critical and Historical Essays Contributed to the Edinburgh Review. London: Longman, Green, Longman, and Roberts, p. 300. 1 2 Bates, Stephen; Norton-Taylor, Richard (15 March 2007). "No pardon for Admiral Byng. The MoD don't want to encourage any others". The Guardian. Retrieved 15 March 2007. 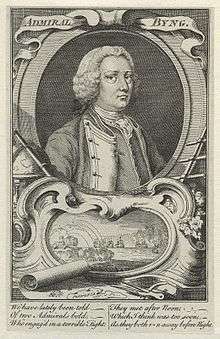 Mrs Saunders-Davies said: "Admiral Byng did not deserve to be shot. He may not have been a brilliant sailor but he had an unblemished career and he had never lost a ship or drowned a sailor. The Byngs won't take the refusal of a pardon lying down. We're going to take this further." ↑ Copping, Jason (23 June 2013). "Family hope pardon for shamed Admiral Byng will finally arrive". The Daily Telegraph. ↑ Rodger, N.A.M. (2004). The Command of the Ocean: A Naval History of Britain, Volume 2, 1649-1815. London: Allen Lane. p. 272. ISBN 0-7139-9411-8. ↑ "Admiral Byng". Bedford Borough Council. Retrieved 29 August 2012. ↑ "Memorial: M4085". Maritime Memorials. National Maritime Museum. Retrieved 5 July 2014. ↑ "Byng". Retrieved 5 June 2015. Massie, Alex (March 14, 2011). 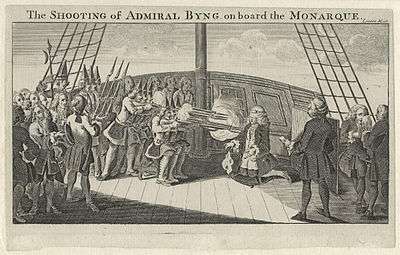 "The Execution of Admiral Byng", The Spectator. Robson, Martin (2016). 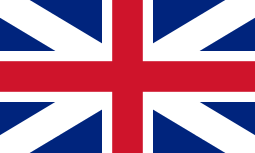 A History of the Royal Navy: The Seven Years War. I.B. Taurus. ISBN 9781780765457. Admiral Byng, The Newgate Calendar.